More than 30 years of fiel d experience in the maintenance of road rail shunters, means that our company has a very clear view on the needs of our end-users. It has also resulted in a deep insight into the strengths and weaknesses of existing road rail shunting locomotives. To national rail transport companies road rail shunters, and particularly the B-Track, represent a far lower investment for shunting operations in their shunting areas, as well as on the private sites of their customers. The fact that in several European countries the B-Track has obtained a licence for circulation on the public track opens up an even wider potential of use. When using B-Track, operators enjoy the smoothness and fine regulation of power through the hydrostatic transmission, enabling the maximum torque of the engine to be delivered at any speed and providing the excellent base for easy approach when coupling. Our roots go back to a company called UCA in the 80s and 90s. UCA was the Unimog dealer for Antwerp and transformed lots of Unimog trucks to road-rail shunters for use in the port of Antwerp. For the heavier shunting jobs and for those customers who didn’t need the on-road driving characteristics of a Unimog UCA the UCA-trac. The production of this road-rail shunter on the base of a JCB telescopic wheel loader started in the year 2000. In 2006 ETIC was created as a company offering concept study, creation, consulting, sales and trade of rail traction vehicles. Both the founders had more than two decades of experience in the railroad traction business. The year after ETIC becomes the importer of the UCA-trac for France. Also in 2007 Rentaloc was created by an ex-UCA employee. 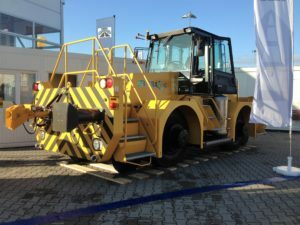 In 2010 ETIC launches the study of a new road-rail shunting machine based on a Mecalac wheel loader. The first B-Track was produced. Then in 2011 Rentaloc takes over UCA’s activities and the year after it becomes part owner of ETIC. In 2014 The RailRoad Factory, TRRF, was created as the group’s unit for assembly of all road-rail shunters. TRRF is base in Cork, Republic of Ireland. Not only construction moved to another country but at the same time the export business is started up. More than 30 years of field experience in the maintenance of road rail shunters, means that our company has a very clear view on the needs of our end-users. It has also resulted in a deep insight into the strengths and weaknesses of existing rail-road shunting locomotives. © Copyright 2016 - TRRF - The Railroad Factory.